Good Lord do I ever love a chimichanga. I think I may have first had one back in my high school days at a local American-Mex joint called Chi-Chi’s. You know this was the type of place where all of us gringos thought we were having real Mexican food, only to realize years later that it was totally not, but only catered to us gringos, and the place would pack it in. Regardless, that’s where my love for the chimichanga was born. 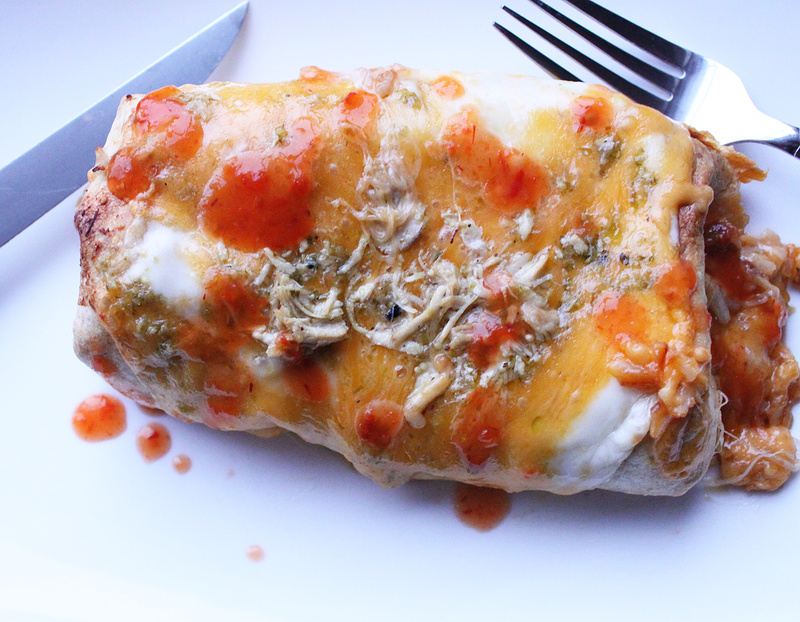 It’s essentially a deep fried burrito, loaded with goodness. Instead of deep frying, I decided I would load these large flour tortillas up with some awesome chicken verde I made, along with rice and beans, and bake them, you know… to be a bit healthier than deep frying. The result was awesome. Still crisp as you may expect from deep frying with way less the hassle. Start by making your salsa verde. Add the tomatillos, garlic, and chilies to a roasting sheet. Place in a 450 degree oven for about 10 minutes or until they are nicely charred. Once cooked, remove them from the oven, let cool, then remove the skin from the garlic cloves. They should pretty much just slide on out. During this time, add the chicken breasts to a large pot of water, bring to a simmer, and cook until the chicken is fully cooked through, about 25 minutes or longer. Once cooked through, remove the chicken breasts to a plate to let cool. Place all of the salsa ingredients into a blender or food processor and blend until you have a fine salsa. Taste and adjust any salt. Clean out that chicken pot. Next, remove the skins from the chicken breasts and discard. Shred all of the chicken and return the shredded chicken back to the pot. Pour in the salsa verde, bring to a medium heat, stirring along the way, and cook for about 20 more minutes. TRUST ME, THIS CHICKEN BY ITSELF IS AWESOME. 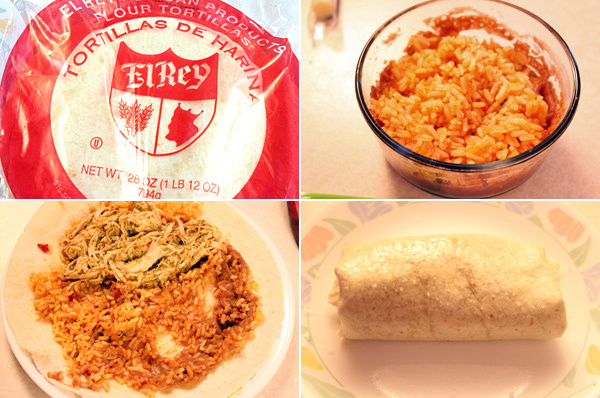 Take a flour tortilla and warm it on a skillet or in a microwave just until it softens. Once it is softened and more pliable, then it is time for the chimichanga making. Lay the tortilla onto a plate, spread on the refried beans, add about a cup of chicken mixture (I use a slotted spoon to remove any excess salsa) onto the tortilla, closest to you, then add on the rice. Roll over a bit tightly, fold in the sides, and continue to roll until you have it seam side down. Lightly brush on some canola oil, and then repeat with any remaining tortillas. I made five for the family, but there is still plenty of chicken to be used for any leftovers, and as in my case enchiladas. Take a baking sheet, add the chimichangas, and cook for about 15 minutes in the preheated oven. The goal is to get them nice and crisp. After about 15 minutes, remove, top with as much Chihuahua and cheddar cheese as you would like, and if you want, a bit more chicken mixture on top, and place back into the oven until the cheese is nicely melted. Remove and serve. I topped mine with some nice habanero hot sauce for some kick. The end result is everything I love about a chimichanga, and my entire family would agree. I don’t think anyone spoke at dinner time that evening as they devoured these things. If you are looking for a great meal, loaded with great flavor and texture, then give these baked chicken verde chimichangas a try. I’m certain you will love them!